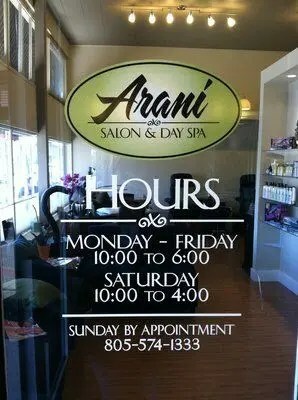 Arani Salon and Day Spa is breathing a breath of fresh air into the Village of Arroyo Grande as we witness a total Village Transformation over the past few years! Not your mother’s Beauty Parlor, this Salon and Spa was designed to be an oasis — and succeed! It is a sanctuary. Yes, all the basics are there — you can have an expertly executed hair cut and color, as well as every type of manicure and pedicure. Aestheticians specializing in the most advanced treatments and masseuses are ready and waiting to rub out those knots. However the difference is the central location — right in the heart of the Village between Andreini’s and Branch Street Deli — and with a soothing spa atmosphere. Tranquil water flows, soothing music plays and yummy candles burn to sooth and calm the senses. Owner Stacy Jensen has decades of experience serving local clientele as well as owning her own Salon in her prior home town. She has gathered the best of her experience and wanted a place to pull all of those thoughts and ideas together. After months of improvements Arani is at last open and thriving and offering everything you might need along with parking in the Village — unheard of! They also cater to larger groups who want to create a party atmosphere — like a pedicure party for a birthday or a bridal party primping and preening for the big day. So stop by … I never miss my twice-a-month visits and this week I think I’ll treat myself to a Birthday Rockstar Pedicure — I’ll be calling you Stacy!